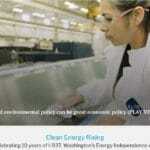 The lead five-minute video explores how Washington’s clean energy landscape has blossomed since Initiative 937 was enacted in 2007. With sections devoted to wind energy, solar energy, hydro, and energy efficiency, the video lets the voices of Washington businesspeople, utility representatives, farmers, and citizens describe how their businesses and lives have thrived as a result of the clean energy boom. Andy Bridge of Janicki Industries in Skagit County describes how his company has built a thriving business manufacturing components for wind turbines. Megan Owen of McKinstry in Seattle talks about how businesses are investing in energy efficiency and, by doing so, creating opportunities for firms that do high-efficiency building management and renovation. Jim Armstrong of the Kittitas County Chamber of Commerce discusses how the rise of wind and solar energy installations has become a major part of the county tax base. Pat McCarty of Tacoma Power explains how his utility is making upgrades and leveraging hydropower to facilitate the growth of other forms of renewable energy while keeping electric rates low. And John Grabner, a farmer in Bickleton, explains how the wind revolution literally “saved the farm”. These stories and others in the video series refute the warnings heard from opponents in 2006, when Washington voters passed I-937, that it would result in skyrocketing electric prices and lost jobs. To the contrary, by stabilizing and accelerating investment in additional clean energy and energy efficiency, I-937 helped trigger an economic boom that has generated thousands of new jobs while the price of electricity in Washington has grown at less than the rate of inflation. The I-937 experience shows there need not be a tradeoff between environmental aspirations and a thriving economy. The lead video is accompanied by four one-minute videos, devoted to wind, solar, hydro, and energy efficiency, with a final one-minute video summarizing the economic benefits to the state. Visitors are encouraged to share the videos with friends and colleagues through social media and to sign up for information and news as Washington’s clean energy economy continues to expand.